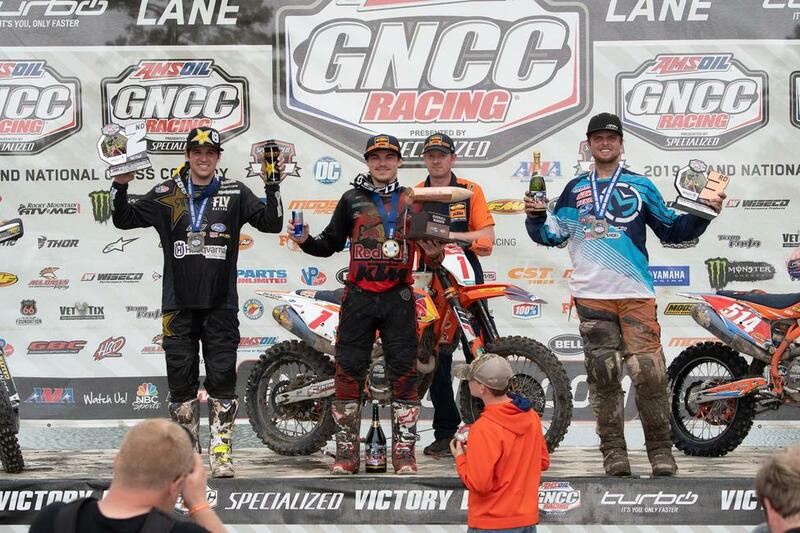 SOCIETY HILL, S.C. – Four rounds into the 2019 AMA Grand National Cross Country (GNCC) Series and the excitement continues to grow as FMF KTM Factory Racing Team’s Kailub Russell raced his way to a marginal victory on Sunday with an exciting finale at the Camp Coker Bullet GNCC in Society Hill, South Carolina. Tely Energy Racing’s Steward Baylor Jr. rounded out the overall podium with a solid third-place performance in his home state. Furthermore, Trail Jesters KTM Racing teammates Ben Kelley and Jesse Ansley topped the XC2 and XC3 divisions, respectively, to give KTM a clean sweep in the three premier classes of the day, as well as Top Amateur honors with teammate Simon Johnson at the helm with a 250 A class victory. With rainfall taking place in the days leading up to Sunday’s racing, the track presented ideal conditions for the afternoon pro race. Just as the green flag waived to signal the start of the race, the rain made a brief return as riders navigated the showers through the beginning of the opening lap. Russell had a great jump off the line aboard his KTM 350 XC-F but he narrowly missed the holeshot going into the second turn. He eventually made his way into the lead on lap one as he tried his best to gap the field early on. Although Russell maintained the lead for a majority of the race, he was soon joined by Thad DuVall and the two riders swapped the lead many times throughout the second half of the race. A mistake by Russell on the final lap allowed DuVall to get within striking distance and the duo battled all the way down to the final moments, with Russell prevailing by only one-second over DuVall. It was a tough day for FMF KTM Factory Racing’s Josh Toth, who made the decision to pull off at the end of lap five after experiencing a hard crash on the previous lap. He began in 10th on the opening lap before charging his way into sixth at the halfway point. While battling in sixth, Toth went down and suffered a minor injury to the head that prevented him from pushing through to the end of the race. It was another flawless day for Ben Kelley, who captured his fourth-consecutive victory in the XC2 250 Pro class. He didn’t get a good jump off the start but he climbed his way into the lead by the second lap and from there, he gapped the field to over two minutes by the halfway point. Kelley continued to put forth dominant laps through the checkers, finishing six-and-a-half minutes ahead of second-place in the class and sixth overall for the day. Jesse Ansley extended KTM’s dominance into XC3 competition as he grabbed his second victory of the season in the class. Ansley shot off the line and into the holeshot before settling into third on the opening lap. He battled in second until the two-lap card fell and from there he dropped the hammer to overtake the lead and win by almost three-and-a-half minutes.